Movin' On Sounds & Security of Franklin Square can protect you and your vehicle from the threat of hitting a deer. Ask about purchasing the Hornet Deer Avoidance system. It's good for you, and it's great for the deer! Every year there are more than 1.7 million reports of automobile collisions with deer. Deer accidents account for more than 1.5 billion dollars in insurance claims annually. Deer are responsible for more death and injury than any other animal in the US. 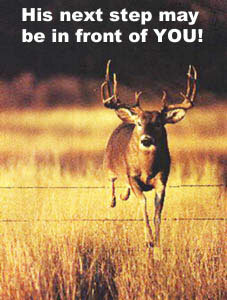 In many areas, your odds are less than 1 in 3 of having a deer/vehicle accident this year. The Hornet Electronic Deer Avoidance System, used with driver awareness, will reduce your risk of hazardous animal/vehicle collision by more than 70%. The Hornet is your best protection against costly and deadly animal related accidents. Using the latest military technology from the field of high pitched, directional sonic bombardment, the Hornet's precision tuned sonic generator alerts deer and other animals of your approach well before they can see or hear your vehicle. Proprietary wave variance tuning enables the sonic impulse to carry long distances. The Hornet is endorsed by major insurance companies and is used by police and emergency vehicles nationwide with millions of proven road miles. Proven effective at any speed, the Hornet is electronically powered and does not rely on wind or air flow. The Hornet Deer Avoidance Device is a precision tuned sonic generator which produces a high pitched, directional sonic wave. When this wave is reflected from the road surface of a moving vehicle, a virtual sonic echo effect is produced. This sonic wave has proven its ability to alert deer and most other animals to approaching vehicles with sufficient warning to avoid costly accidents. The use of the Hornet, along with driver awareness, has been proven to reduce the risk of animal/vehicle collision by more than 70%. The electronically produced sonic wave is effective at any vehicle speed. 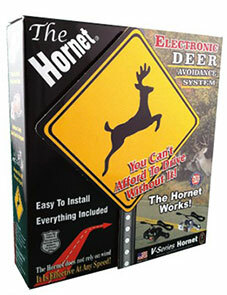 The Hornet Deer Avoidance Device is your best protection from vehicle damage and deadly animal related accidents. A. No.The Hornet should not be compared with air activated deer whistles. In the lab and field testing we performed on deer whistles from 1995 to 1998, we found that air activated deer whistles require a minimum of a 48 M.P.H. direct air flow to produce any measurable sound level. In our opinion, air activated deer whistles have little to no effect on deterring deer/vehicle accidents. A. 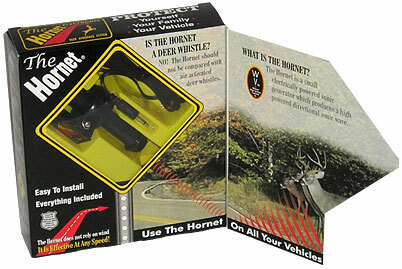 The Hornet is not a magical device, although it is a highly effective deterrent against deer/vehicle collisions. We estimate using The Hornet, along with driver awareness, will reduce your risk of a deer/vehicle accident by more than 70%. The Hornet was tested on deer accident-prone police and emergency vehicles over a 3-year period with more than 6 million proven accident-free miles before it was brought to market. A. No. Just as you cannot hear The Hornet while you are driving, neither will your animals.The Hornet's directional sonic wave is focused ahead of your vehicle. A. The new Hornet V Models utilize the latest and most reliable electronic technology and do not require grounding to the vehicle chassis. The V Models also come with a 4' pigtail and a 3.5mm plug which connects to a new wiring harness which is complete with an inline fuse and does not require drilling a hole in the firewall for the control switch. A. The V-120 and V-120C are 120 dB units with a wave carrying length of approximately 1,700 feet. The V-120C Model has the same specifications as the V-120 except it is triple chrome plated which makes it ideal for motorcycles and certain applications where chromewould be wanted.The V-135 Interstate is a 135 dB unit with a wave carrying length of approximately 2,200 feet. Because of its power and range, the V-135 is designed to be used on interstate highways and rural high-risk areas.